The looped host defense peptide CLP-19 is derived from a highly functional core region of the Limulus anti-LPS factor and exerts robust anti-LPS activity by directly interacting with LPS in the extracellular space. We previously showed that prophylactic administration of CLP-19 even 20 h prior to LPS challenge might significantly increase the survival rate in a lethal endotoxin shock mouse model. Such an effect may be associated with immune regulation of CLP-19. To investigate the underlying mechanisms, peptide affinity chromatography, immunofluorescence, and Western blotting procedures were used to identify α- and β-tubulin as direct and specific binding partners of CLP-19 in the mouse macrophage cell line RAW 264.7. Bioinformatic analysis using the AutoDock Vina molecular docking and PyMOL molecular graphics system predicted that CLP-19 would bind to the functional residues of both α- and β-tubulin and would be located within the groove of microtubules. Tubulin polymerization assay revealed that CLP-19 might induce polymerization of microtubules and prevent depolymerization. The immunoregulatory effect of CLP-19 involving microtubules was investigated by flow cytometry, immunofluorescence, and Western blotting, which showed that CLP-19 prophylactic treatment of RAW 264.7 cells significantly inhibited LPS-induced surface expression of TLR4. Taken together, these results suggest that CLP-19 binding to microtubules disrupts the dynamic equilibrium of microtubules, reducing the efficacy of microtubule-dependent vesicular transport that would otherwise translocate TLR4 from the endoplasmic reticulum to the cell surface. Lipopolysaccharide is a major component of the outer membrane of Gram-negative bacteria and stimulates the host immune response upon interaction with the pattern-recognition receptor TLR expressed on host cells (1, 2). Upon binding, TLR4 combined with CD14 can activate downstream intracellular signaling; in macrophages, this signaling promotes the release of a variety of proinflammatory cytokines, such as TNF-α, IL-1β, and IL-6 (3). Abundant or accumulated concentrations of LPS can overstimulate the TLR-mediated immune response, leading to an exaggerated proinflammatory state that can cause significant cell and tissue injury (4–6). In some cases, the patient is unresponsive to therapeutic intervention and the mounting proinflammatory state progresses to sepsis, a severe clinical syndrome with a mortality rate of >50% (7, 8). Extensive research effort has been put forth to devise an efficacious prophylactic strategy against LPS-mediated sepsis; to this end, identifying the mechanisms by which LPS stimulates the host immune response may also identify potential molecular targets for inhibiting the process. Host defense peptides (HDPs) have emerged as promising candidates for such a molecular therapeutic strategy owing to their inherent potency in alleviating innate immune responses associated with excessive bacterial infection. This interest has led to the characterization and isolation of numerous HDPs from animals, insects, plants, and even bacteria. For example, polymyxin B (9, 10), bactericidal/permeability-increasing protein (11–13), CAP-18 (14-17), and mastoparan peptide (18) exhibit robust LPS-neutralizing activity in vitro and protection against lethal endotoxin shock in mouse models. Another HDP, the Limulus anti-LPS factor (LALF), which is a small basic protein from the arthropods Tachypleus tridentatus and Limulus polyphemus, is particularly attractive because it inhibits the endotoxin-mediated activation of the coagulation cascade by binding to LPS (19, 20). We previously characterized the core domain of LPS binding in LALF (amino acids 31–52) (21) and used this sequence to generate a novel peptide, CLP-19, with optimized anti-LPS activity. Composed of 19 aa residues, CLP-19 is head-to-tail looped via a disulfide bond and possesses cationic, amphipathic structure. Our previous research showed that CLP-19 not only neutralized LPS in vitro but also protected mice from lethal endotoxin shock when simultaneously delivered with LPS (22). At the molecular level, CLP-19 significantly reduced LPS-induced TNF-α release and phosphorylation of the MAPK signaling protein p38 (23). Furthermore, prophylactic i.p. injection of CLP-19 into mice prior to bacterial infection remarkably enhanced survival; the most significant survival effect was achieved with 20 h of pretreatment (versus 5 and 10 h; data not shown). Collectively, these data suggest that the pleiotropic functions of CLP-19 not only involve direct binding with LPS but also modulation of the host innate immune system. In this study, we describe our subsequent investigation of the immunoregulatory mechanisms of CLP-19, which include identification of direct binding partners, characterization of the binding interactions, and determination of the effects related to immune response networks at a cellular level. The head-to-tail–looped peptide CLP-19 (CRKPTFRRLKWKIKFKFKC; molecular mass, 2511.1 Da) and the linear chain peptide LL-37 (LLGDFFRKSKEKIGKEFKRIVQRIKDFLRNLVPRTES; molecular mass, 4492.4 Da) were synthesized by the Symphony Peptide Synthesizer (Protein Technologies, Tucson, AZ) using a stepwise solid-phase peptide assembly procedure starting with an Fmoc-Lys(Boc)-Wang resin. After drying, the peptides were cleaved and purified by trifluoroacetic acid mixture solution and HPLC (Shen Zhen Hybio Engineering, Shenzhen, China) to achieve a purity of 98.4% for CLP-19 and 99.1% for LL-37. CLP-19 and LL-37 were biotinylated at the last cysteine and leucine side chain of the N-terminal, respectively. The resultant CLP-19 and LL-37 peptides and Nα-(3-maleimidylpropionyl)biocytin were dissolved in N,N-dimethylformamide and mixed with resin. The solution was then reacted with 1-hydroxybenzotriazole, benzotriazol-1-yl-oxytripyrrolidinophosphonium hexafluorophosphate, and N,N-diisopropylethylamine in nitrogen gas for 2 h at room temperature before cleaving and purifying by trifluoroacetic acid mixture solution and HPLC to achieve a purity of 99.6% for CLP-19/biocytin (CLP-19B) and 95.2% for LL-37/biocytin (LL-37B). The unbiotinylated CLP-19 was also labeled with FITC at the last N-terminal cysteine side chain. The resultant CLP-19 peptide and FITC were reacted in a pyridine/N,N-dimethylformamide/dichloromethane (12:7:5 v/v) solution in nitrogen gas for 2 h at room temperature and then cleaved and purified by trifluoroacetic acid mixture solution and HPLC to achieve a purity of 98.8% for CLP-19/FITC (CLP-19F). CLP-19, CLP-19B, and CLP-19F (all 4 μM) were dissolved in Tris-HCl buffer (10 mM [pH 7.4]). The lipid was prepared using 2-oleoyl-1-palmitoyl-sn-glycero-3-phosphocholine (POPC; Sigma-Aldrich, St. Louis, MO) and 2-oleoyl-1-palmitoyl-sn-glycero-3-phospho-rac-1-glycerol (POPG; Sigma-Aldrich) as described previously (24). The concentration of POPC/POPG (1:1) was 1 mM. Circular dichroism (CD) measurements were performed at room temperature on a J-810 spectropolarimeter (Jasco, Tokyo, Japan) using a 0.5-cm path length quartz cell. Spectra were recorded over a wavelength range of 190–250 nm with bandwidth of 1 nm, scanning speed of 50 nm/min, step size of 0.1 nm, and response time of 2 s. Each CD spectrum was an average of 10 scans with the buffer background subtracted. The mouse macrophage cell line RAW 264.7 was obtained from the Department of Immunology at the Third Military Medical University (Chongqing, China) and cultured in DMEM (Invitrogen, Shanghai, China) supplemented with 10% FBS (TBD, Tianjing, China), 100 U/ml penicillin, and 100 U/ml streptomycin (Beyotime, Jiangsu, China) at 37°C under 5% CO2. RAW 264.7 cells (1 × 105/well) were seeded in 96-well plates and incubated overnight. Peptide was added and allowed to coincubate at 37°C. After five washes with PBS to remove unbound peptides, 100 ng/ml LPS (Sigma-Aldrich) was added and reacted for 4 h at 37°C. The samples were collected and TNF-α and p-IκB-α levels were measured with ELISA kits (Merck, Darmstedt, Germany; eBioscience, San Diego, CA). Increasing concentrations of CLP-19, CLP-19B, or CLP-19F were coincubated with 0.5 endotoxin unit/ml LPS for 30 min at 37°C. A mixture (100 μl) was collected and reacted to an equal volume of the Limulus amebocyte lysate (LAL) reagent. The kinetic turbidity was measured using an ATi-321 tube reader (Lab Kinetics, Somerset, U.K.). RAW 264.7 cells (1 × 104/well) were seeded in 96-well plates and cultured for 2 h at 37°C. Increasing concentrations of CLP-19, CLP-19B, or CLP-19F were added and allowed to react for 4 h, followed by addition of 20 μl MTT (5 mg/ml in PBS; Beyotime) for another 4 h. Afterward, the medium was removed and 150 μl DMSO was used to dissolve formazan. The OD540 of each well was measured using a SpectraMax M2e spectrophotometer (Molecular Devices, Sunnyvale, CA). RAW 264.7 cells (5 × 106/treatment) were washed with modified Dulbecco’s PBS (Pierce/Thermo Scientific, Rockford, IL) and lysed in ice-cold immunoprecipitation lysis/wash buffer (0.025 M Tris, 0.15 M NaCl, 0.001 M EDTA, 1% Nonidet P-40, 5% glycerol) containing a protease inhibitor mixture (Pierce). After incubating on ice for 5 min with periodic mixing, the protein-containing fraction (supernatant) was separated by centrifugation at 13,000 × g for 10 min. Proteins were coincubated with CLP-19B for 30 min at 37°C, and then NeutrAvidin UltraLink immobilized resin (Pierce) was added and the incubation continued for another 1 h at room temperature with mixing (unless mentioned otherwise). The resin-bound complex was washed with binding buffer (0.1 M phosphate, 0.15 M NaCl, 0.1% SDS [pH 7.2]) and boiled in SDS-PAGE sample buffer for 10 min to elute the bound proteins. The proteins were separated by 12.5% SDS-PAGE and visualized by staining with Coomassie blue. For Western blot analysis, the proteins were elecrotransferred to polyvinylidene difluoride micropore membranes and blocked by incubating with skim milk (5% in TBST) for 1 h at 37°C. After washing, the membranes were incubated with mouse monoclonal α- or β-tubulin Abs (1:2000 dilution; Sigma-Aldrich) or TLR4 Ab (5 μg/ml; Abcam, Cambridge, U.K.) overnight at 4°C, followed by incubation with HRP-conjugated goat anti-mouse secondary Ab (1:5000; ZSGB-Bio, Beijing, China) for 1 h at 37°C. Immunoreactive proteins were visualized with the diaminobenzidine substrate (ZSGB-Bio). The Coomassie blue–stained bands were manually excised from SDS-PAGE gels and washed with 50% acetonitrile until the gel slice became colorless. The slices were then freeze-dried and treated with DTT and iodoacetamide and incubated in sequencing grade trypsin (Promega, Madison, WI) overnight at 37°C. The digested proteins were then extracted using 45% methyl cyanides, 5% formic acid, and 50% deionized water and analyzed by HPLC-(micro)chip-mass spectroscopy (MS)/MS (6300 ion trap system; Agilent Technologies, Santa Clara, CA). The orthogonal nanoelectrospray source was operated at 2000 V with a PicoTip emitter (New Objective, Woburn, MA). Protein identification was performed automatically by the accompanying Spectrum Mill software (Agilent Technologies). Purified bovine tubulins (Cytoskeleton, Denver, CO) were reconstituted in general tubulin buffer (80 mM PIPES, 2 mM MgCl2, 0.5 mM EGTA, 1 mM GTP [pH 7.0]; Cytoskeleton) and polymerized to microtubules by incubating with cushion buffer (80 mM PIPES, 1 mM MgCl2, 1 mM EGTA, 60% glycerol [pH 7.0]; Cytoskeleton) for exactly 20 min at 35°C. The solution was then stabilized by diluting with 200 μl general tubulin buffer plus taxol (Cytoskeleton) at room temperature. Coincubations of diluted tubulins with 0.8 mg/ml CLP-19, 0.3 mg/ml microtubule-associated proteins (MTAPs, containing 60% MTAP2 at 280 kDa and 40% tau proteins at 40–70 kDa; Cytoskeleton), or 0.2 mg/ml BSA (containing 100% BSA at 68 kDa; Cytoskeleton) were carried out for 30 min at room temperature. Each solution (including negative controls without microtubules) was then laid over respective cushion buffers containing taxol and centrifuged at 100,000 × g for 40 min at room temperature. The supernatants and pellets were collected, separated by SDS-PAGE, and visualized by staining with Coomassie blue. RAW264.7 cells (2 × 104/well) were grown on coverslips in 24-well plates for 24–48 h and washed with ice-cold DMEM. For peptide-binding protein tests, cells were coincubated with 10 μg/ml CLP-19F for 1 h at 37°C in the dark. After five washes with PBS, cells were fixed with ice-cold methanol for 10 min and reacted with 1% BSA for 30 min at room temperature. The mouse monoclonal β-tubulin Ab (20 μg/ml; Sigma-Aldrich) was added and allowed to react for 1 h, followed by Alexa Fluor 555–conjugated goat anti-mouse homologous IgG (1:500; Beyotime) reaction for 1 h and DAPI (1:1000; Beyotime) reaction for 5 min. For tubulin polymerization tests, cells were pretreated with 100 μg/ml CLP-19 for 1 h at 37°C and counterstained for β-tubulin with Alexa Fluor 555. Untreated cells were used as control. For an immunoregulatory effects test, cells were pretreated with 50 μg/ml CLP-19 for 5 h at 37°C. After washes, 100 ng/ml LPS (Sigma-Aldrich) was added and allowed to react for 4 h at 37°C. Cells were counterstained for β-tubulin with Alexa Fluor 555 and then reacted with mouse monoclonal TLR4 Ab (5 μg/ml; Abcam) for 1 h and Alexa Fluor 488–conjugated goat anti-mouse homologous IgG (1:500; Beyotime) for 1 h. Coverslips were mounted and fluorescence was detected with an LX81 epifluorescent microscope (Olympus, Tokyo, Japan). Free, purified bovine α- and β-tubulin subunits (Cytoskeleton) were dissolved in chilled (4°C) tubulin polymerization buffer (80 mM PIPES [pH 6.9], 2 mM MgCl2, 0.5 mM EGTA, 1 mM GTP, 10.2% glycerol; Cytoskeleton) and immediately mixed with prewarmed (37°C) CLP-19 solution to achieve final concentrations of 3 mg/ml tubulin and 20 μM CLP-19. The polymerization reaction was allowed to progress for 60 min at 37°C and then the temperature was switched to 4°C for 30 min, during which time changes in the OD at 340 nm were recorded every 5 min using a SpectraMax M2e spectrophotometer (Molecular Devices). Control reactions consisted of tubulins alone (to generate the standard polymerization curve), with 20 μM LL-37, or with 10 μM paclitaxel. The three-dimensional structure of CLP-19 was predicted by Discovery Studio version 2.55 software. The heterodimer structures of α- and β-tubulin were extracted from the Research Collaboratory for Structural Bioinformatics Protein Data Bank (http://www.rcsb.org/pdb/explore.do?structureId=1jff). Computer-simulated docking studies were performed by the AutoDock Vina molecular docking software (http://vina.scripps.edu/), which allowed hydrogen atoms to be added to the grid set in the center of the active site region that involved all functional amino acid residues. A set of possible binding models of CLP-19 and α- and β-tubulin heterodimers was created according to the principle of minimum energy, and the functional residues of CLP-19 and α- and β-tubulin heterodimers were further predicted by PyMOL software (http://pymol.org/). Surface expression of TLR4 on RAW 264.7 cells was detected by immunostaining. Adherent RAW 264.7 cells (5 × 106/treatment) were pretreated with 50 μg/ml CLP-19 at 37°C. After five washes with PBS to remove unbound CLP-19, 100 ng/ml LPS (Sigma-Aldrich) was added and allowed to react for 4 h at 37°C. LPS-simulated cells, CLP-19-treated cells, and nontreated cells served as controls. After reaction, cells were collected, washed with ice-cold PBS, and blocked with 1% BSA for 1 h on ice. After an additional wash, the live RAW 264.7 cells were incubated with mouse monoclonal TLR4 Ab (1 μg/106 cells; Abcam) or homologous IgG control Ab (1 μg/106 cells; Abcam) for 20 min on ice. After a final gentle wash, the cells were incubated with Alexa Fluor 488–conjugated goat anti-mouse homologous IgG (1:500; Beyotime) for 20 min on ice and analyzed by flow cytometry (FACSCanto II; Becton Dickinson, Franklin Lakes, NJ) with gating for 20,000 events. RAW 264.7 cell monolayers (5 × 106 cells for each treatment) were subjected to subcellular fractionation by using the ProteoExtract subcellular proteome extraction kit (Merck). Adherent cultured cells were washed twice with wash buffer at 4°C (5 min each) and extracted by incubating in the following respective subcellular fraction-specific buffers combined with protease inhibitor mixture at 4°C with gentle agitation: cytosolic fraction in extraction buffer 1 (10 mM PIPES, 0.02% digitonin, 300 mM sucrose, 15 mM NaCl, 0.5 mM EDTA [pH 6.8]) for 10 min; membrane/organelle protein fraction in extraction buffer 2 (10 mM PIPES, 0.5% Triton X-100, 300 mM sucrose, 15 mM NaCl, 0.5 mM EDTA [pH 7.4]) for 30 min; nucleic protein fraction in extraction buffer 3 (10 mM PIPES, 1.0% Tween 40, 0.5% deoxycholate, 350 mM NaCl, 500 U/ml benzonase [pH 7.4]) for 10 min; and cytoskeletal fraction in extraction buffer 4 (5% SDS, 10 mM Na2HPO4, 10 mM H2PO4 [pH 7.4]) for 30 min. Significance of intergroup differences (p < 0.05) was evaluated by the Student t test or one-way analyses of variance. Data are presented as means of at least three independent experiments ± SD. The secondary structures of CLP-19, CLP-19B, and CLP-19F were detected by CD spectroscopy. Three peptides exhibited an unstructured state in free solution but converted to an α-helical structure when in the presence of large unilamellar POPC/POPG (1:1) vesicles, as characterized by the maxima at 195 nm and minima at 210 and 222 nm (Fig. 1A). The similar secondary structures of CLP-19, CLP-19B, and CLP-19F in two different environments suggested that the link of biocytin or FITC had negligible influence on the structure of CLP-19. Similar structural and biological properties of CLP-19, CLP-19B, and CLP-19F. (A) CD spectra of CLP-19, CLP-19B, and CLP-19F. Peptides (4 μM) were dissolved in Tris-HCl buffer (10 mM, pH 7.4) with and without POPC/POPG (1:1) liposomes (1 mM). (B) RAW 264.7 cells were pretreated with CLP-19, CLP-19B, or CLP-19F (20 μM) for 5 h and subsequently stimulated by LPS (100 ng/ml) exposure. The levels of TNF-α in the supernatants were analyzed using an ELISA kit. The LPS-stimulated cells, peptide-treated cells, and nontreated cells served as controls. Numerical data represent means ± SD (n = 6). *p < 0.05 versus LPS, #p < 0.05 versus peptide alone. (C) Cells were treated as in (B). p-IκB-α was analyzed using an ELISA kit. The OD450 was measured against the phosphorylation level of IκB-α. Controls included LPS-stimulated cells, peptide-treated cells, and nontreated cells. Numerical data represent means ± SD (n = 6). *p < 0.05 versus blank control, #p < 0.05 versus LPS. (D) Increasing concentrations of peptides were coincubated with LPS (0.5 endotoxin unit/ml) and subsequently mixed with an equal volume of LAL reagent. The kinetic turbidity was measured using an ATi-321 tube reader. Numerical data represent means ± SD (n = 6). (E) RAW 264.7 cells were coincubated with various concentrations of peptides and then treated with MTT (20 μl, 5 mg/ml in PBS) and DMSO (150 μl). The OD540 was measured against the viability of cells. Nontreated cells were used as a blank control. Numerical data represent means ± SD (n = 6). *p < 0.05 versus blank control. Moreover, the main biological functions of CLP-19 and its counterparts were compared. Addition of peptides alone to the unstimulated cells had no effect on the amount of TNF-α compared with the completely untreated cells (p > 0.05). Prophylactic peptide treatments prior to LPS challenge were found to significantly attenuate the release of TNF-α in RAW 264.7 cells. CLP-19B and CLP-19F displayed very similar effects (attenuation of TNF-α release) to CLP-19 (p > 0.05) (Fig. 1B). The influence of peptides on NF-κB signaling was also studied. CLP-19 and its counterparts were able to induce phosphorylation of IκB-α. However, prophylactic administration might inhibit the LPS-induced upregulation of p-IκB-α. Three peptides displayed similar activity to NF-κB signaling (p > 0.05) (Fig. 1C). CLP-19 could neutralize the activities of LPS via direct binding (22). The LAL test showed that there were no statistically significant differences in neutralizing LPS activity of CLP-19B and CLP-19F compared with CLP-19 at concentrations between 10 and 100 μM (p > 0.05) (Fig. 1D). The cytotoxicity of three peptides toward mouse macrophages was established using an MTT assay. CLP-19, CLP-19B, and CLP-19F were not observed to be toxic to RAW 264.7 cells up to a 100 μM concentration (p > 0.05). By further increasing the concentration of peptides up to 200 μM, significant cytotoxicity was exhibited. However, there were no significant differences of cytotoxicity between CLP-19 and its counterparts in this study (p > 0.05) (Fig. 1E). CLP-19–specific interacting proteins were detected in RAW 264.7 cells by screening cells with an affinity tag pull-down method. Most proteins found bound to CLP-19, rather than to LL-37 peptide, and were of 50 kDa in size (Supplemental Fig. 1). 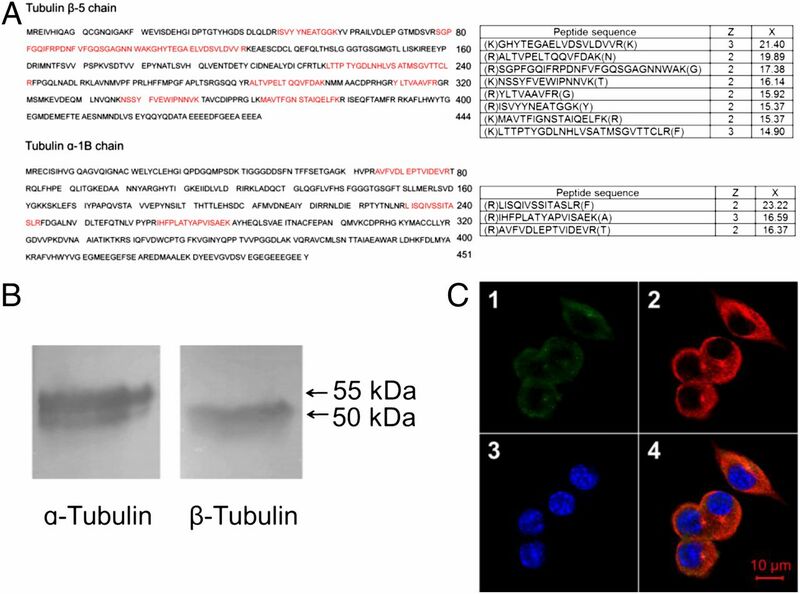 MS analysis identified the 50-kDa pull-down protein as α- and β-tubulin (Fig. 2A), which are the basic subunits of microtubules (25, 26). Western blotting of CLP-19–bound proteins showed immune reactivity with the monoclonal α- and β-tubulin Abs for the bands at 55 and 50 kDa, respectively (Fig. 2B). Immunofluorescence assay of live RAW 264.7 cells showed that CLP-19F colocalized intracellularly with microtubules stained with β-tubulin and Alexa Fluor 555 (Fig. 2C). Collectively, these data indicated that α- and β-tubulin/microtubules bound to CLP-19 both in vitro and in vivo. CLP-19 peptide binding to α- and β-tubulin. (A) MS of 50-kDa band obtained by affinity tag pull-down of CLP-19B and RAW 264.7 cell lysates. x, Correlation score (representation of how well the mass spectrum matches a pregenerated standard for that particular sequence); z, charge of the peptide sequence. Red indicates the positions of the peptides in the full length of tubulin isoforms. (B) Immunoblot of pull-down proteins of CLP-19B and RAW 264.7 cell lysates probed with mouse monoclonal α- and β-tubulin Abs. (C) Immunofluorescent microscopic detection of RAW 264.7 cells treated with CLP-19F: (C1) CLP-19 (FITC, green), (C2) β-tubulin (Alexa Fluor 555, red), (C3) nucleus (DAPI, blue), (C4) merge. To investigate whether CLP-19 interacts with microtubules through a direct manner, we performed a microtubule-binding protein spin-down assay. The CLP-19 sample showed a band of 2.5 kDa (corresponding to CLP-19 alone) in the supernatant and not in the pellet fraction, suggesting that CLP-19 could not pellet during centrifugation (Fig. 3A). The CLP-19 plus microtubule sample showed a 2.5- and a 55-kDa band in the pellet and not in the supernatant fraction, suggesting that CLP-19 was associated with microtubules and pelleted together during centrifugation (Fig. 3A). A similar association pattern was observed for the MTAP samples and MTAP plus microtubule samples, suggesting that most of the MTAPs appeared in the supernatant fraction in the absence of microtubules (Fig. 3A) but appeared in the pellet fraction in the presence of microtubules (Fig. 3A). In contrast, BSA, which does not bind to microtubules, remained in the supernatant fraction regardless of the presence of microtubules (Fig. 3A). CLP-19 direct interaction with microtubules. (A) Supernatants (S) and pellets (P) of purified microtubules (1 μM) incubated with CLP-19 (0.8 mg/ml), MTAPs (0.3 mg/ml), or BSA (0.2 mg/ml), resolved by SDS-PAGE, and visualized with Coomassie blue stain. (B) The pull-down proteins of increasing concentrations of CLP-19B coincubation with purified microtubules (1 μM) were resolved by SDS-PAGE. The Coomassie blue stain intensities (grayscale values) of pull-down proteins bands versus purified microtubules bands are shown plotted against the percentage of bound microtubules. Numerical data represent means ± SD (n = 6). (C) The pull-down proteins of CLP-19B (250 μM) coincubation with unpolymerized free α- and β-tubulin (1 μM) and taxol-polymerized microtubules (1 μM) were resolved by SDS-PAGE and visualized with Coomassie blue stain. The bound percentages of tubulins and microtubules are quantitated as in (B) and shown graphically. Numerical data represent means ± SD (n = 6). *p < 0.05 versus tubulin. When microtubules were coincubated with increasing concentrations of CLP-19B, the amount of microtubules bound to CLP-19B increased in a dose-dependent manner up to a 250 μM concentration. Increasing the concentration of CLP-19B to >250 μM (up to 1000 μM) only slightly increased the bound microtubules (Fig. 3B). Thus, the concentration of CLP-19B required to achieve half-maximal binding (Kd) was determined to be 45.7 μM. In vivo, microtubules exist in a dynamic state between microtubules and free α- and β-tubulin subunits. Therefore, a pull-down assay was performed to determine whether CLP-19 was able to bind microtubules or free α- and β-tubulin subunits. Both of the microtubules polymerized by taxol and α- and β-tubulin subunits without polymerization were shown to interact with CLP-19 when coincubated overnight at 4°C (to avoid polymerization of free α- and β-tubulin subunits), but not with the LL-37 peptide or biotin control (Fig. 3C). However, the binding percentage of microtubules was higher than depolymerized α- and β-tubulin subunits (Fig. 3C). To determine the specificity of CLP-19 interaction with microtubules, competition binding assays were performed. Preincubation with unlabeled CLP-19 led to a dose-dependent decrease in CLP-19B binding to microtubules (Fig. 4A). In contrast, preincubation with unlabeled LL-37 control peptide produced only a slight general decease in CLP-19B binding to microtubules. Specificity of CLP-19 interaction with microtubules. (A) Microtubules (1 μM) were preincubated with increasing concentrations of CLP-19 or LL-37 (negative control) and then incubated with CLP-19B (250 μM). Pull-down proteins were resolved by SDS-PAGE and visualized with Coomassie blue stain. The band intensities (grayscale values) of pull-down proteins versus purified microtubules are plotted against the percentage of bound microtubules. Numerical data represent means ± SD (n = 3). 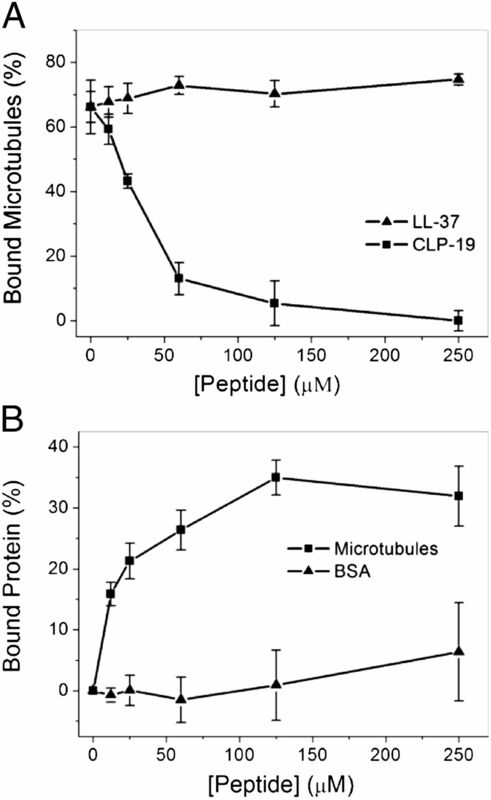 (B) Microtubules (1 μM) or BSA (1 mM) were incubated with increasing concentrations of CLP-19B and resolved and analyzed as in (A). Numerical data represent means ± SD (n = 3). To further validate the specific binding of CLP-19 and microtubules, pull-down assays were performed with microtubules or BSA. A significantly higher and dose-dependent binding percentage was observed with microtubules compared with BSA, even at the lowest concentration of 12 μM CLP-19 and when the amount of microtubules used was 1000-fold lower than that of BSA (Fig. 4B). To investigate the influence of ionic strength on CLP-19 binding to microtubules, a pull-down assay was performed in various concentrations of NaCl (0–400 mM). The amount of pulled-down microtubules changed slightly across the entire range (Fig. 5A), indicating that the ionic strength seldom interfered with the interaction of CLP-19 and microtubules. Characterization of CLP-19 binding to microtubules. (A) Microtubules were interacted with CLP-19B in the presence of increasing concentrations of NaCl. Pull-down proteins were resolved by SDS-PAGE and visualized with Coomassie blue stain. The band intensities (grayscale values) of pull-down proteins versus purified microtubules are plotted against the percentage of bound microtubules. Numerical data represent means ± SD (n = 3). (B) The predicted three-dimensional structure of CLP-19 (green) bound to α- and β-tubulin (blue/purple) heterodimers. The inset shows the unbound CLP-19 peptide structure. (C) Predicted active sites of the CLP-19 interaction with microtubules. Red arrows indicate the pairs of amino acid residues that are likely to form hydrogen bonds. The predicted three-dimensional structure of CLP-19 is shown in Fig. 4B (inset). AutoDock Vina generated a set of possible conformations of CLP-19 and α- and β-tubulin heterodimers (Supplemental Fig. 2), which were modeled according to the energy minimization principal (Supplemental Table I). The simulated docking models demonstrated that the looped CLP-19 tended to bind in the groove of the α- and β-tubulin heterodimers (Fig. 5B). The binding model with lowest energy was chosen for further investigation using PyMOL software to identify the active sites of the three binding partners. CLP-19 was predicted to interact with the following residues of α-tubulin: Gln11, Val14, Gln15, Asn18, Ala19, Val74, Ile75, Glu77, Val78, Thr80, Gly81, Thr82, Arg221, Thr223, Thr225, Asn226, Asn228, Arg229, Val363, Pro364, Gly365, Gly366, Asp367, and Leu368. CLP-19 was also predicted to interact with the following residues of β-tubulin: Asr39, Ser40, Asp41, Leu42, Gln43, Glu47, Pro245, Gly246, Gln247, Arg322, Asp357, Ile358, Pro359, Pro360, Arg369, Gly370, Leu371, and Lys372. 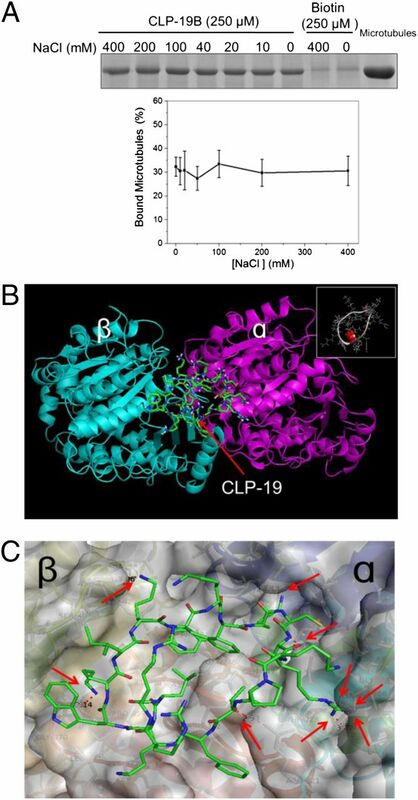 When the interatomic threshold distance was set at 5 Å, at least 24 pairs of residues might have atomic contact between CLP-19 and α-tubulin and 18 pairs of residues might have contact between CLP-19 and β-tubulin. Moreover, when the hydrogen bond threshold distance was set at 3.2 Å, seven pairs of likely hydrogen bonds were found between CLP-19 and α-tubulin and two pairs were found between CLP-19 and β-tubulin (Fig. 5C). The function of microtubules is closely related to the dynamic flux of polymerization and depolymerization. Compounds that bind to tubulins often influence the dynamic process of microtubules, altering one or more phases of the polymerization process. In the standard polymerization reaction, α- and β-tubulin polymerized to microtubules at a rate (maximum velocity) of 7.4 milli-OD/min when the polymerization temperature was set at 37°C. Addition of CLP-19 to the polymerization reaction not only increased the maximum velocity to 43.6 milli-OD/min but eliminated the nucleation phase and enhanced the overall polymer mass. Addition of the LL-37 control peptide did not produce these effects (Fig. 6A). The CLP-19–induced polymerization of microtubules was confirmed by immunofluorescence in vivo (Fig. 6B). When the polymerization temperature was changed to 4°C, a gradual depolymerization of microtubules was exhibited in the standard polymerization reaction. However, a similar phenomenon of depolymerization was not observed in the CLP-19–induced polymerization reaction, suggesting that CLP-19 was able to stabilize the microtubules against depolymerization by cold (Fig. 6A). Thus, the data demonstrated that CLP-19 specifically induced polymerization and prevented depolymerization of microtubules. CLP-19 exerts an immunomodulatory effect through TLR4. (A) Free α- and β-tubulin subunits (3 mg/ml) were interacted with CLP-19 (20 μM), LL-37 (20 μM), or paclitaxel (10 μM) for 1 h at 37°C, and then the polymerization temperature was changed to 4°C (arrowhead) for 30 min. The kinetic turbidity was recorded by measuring the OD340 per 5 min for 90 min. The blank reaction with tubulins alone represents the standard polymerization curve. (B) RAW 264.7 cells counterstained with Alexa Fluor 555 (β-tubulin) were detected by immunofluorescence microscopy: (B1) untreated cells, (B2) CLP-19 (100 μg/ml)–treated cells. (C) RAW 264.7 cells pretreated with CLP-19 (50 μg/ml) for 5 h and subsequently stimulated by LPS (100 ng/ml) exposure were subjected to flow cytometry to detect effects on TLR4 surface expression. LPS-simulated cells, CLP-19–treated cells, nontreated cells, and homologous IgG control Ab–treated cells served as controls. Numerical data represent means ± SD (n = 6). *p < 0.05 versus blank, #p < 0.05 LPS versus CLP-19 plus LPS. (D) RAW 264.7 cells counterstained with Alexa Fluor 555 (β-tubulin) and 488 (TLR4) were detected by immunofluorescence microscopy: (D1) untreated cells, (D2) CLP-19 (50 μg/ml) pretreated cells without LPS stimulation, (D3) non–pretreated cells stimulated with LPS (100 ng/ml), (D4) cells pretreated with CLP-19 and subsequently stimulated by LPS. Arrowheads indicate high amounts of TLR4 that appear on the cell surface. (E) Membrane and total proteins of RAW 264.7 cells, treated as in (C), were resolved, blotted, and probed with mouse monoclonal TLR4 and α-tubulin Abs. (F) RAW 264.7 cells pretreated with CLP-19 (50 μg/ml) at various times and subsequently stimulated by LPS (100 ng/ml). The surface TLR4 and TNF-α in the supernatants were analyzed using flow cytometry and an ELISA kit, respectively. Numerical data represent means ± SD (n = 6). The effects of CLP-19 interaction with microtubules on cell surface expression of TLR4 were assessed by flow cytometry. RAW 264.7 cells stimulated with LPS exhibited the highest fluorescence intensity, indicating a large amount of TLR4 expression on the cell membranes. Addition of CLP-19 alone to the unstimulated cells had no effect on the amount of events (TLR4 expression), compared with the completely untreated cells. However, preincubation with CLP-19 prior to LPS stimulation resulted in significantly lower amounts of TLR4 on the cell membranes (Fig. 6C). These results were confirmed by immunofluorescence (Fig. 6D) and by Western blotting detection of TLR4 in the membrane protein fraction of the treated cells (Fig. 6E). The effect of CLP-19 on total TLR4 was also studied. The amount of total TLR4 was found to be nearly identical in the untreated cells and CLP-19–treated cells (Fig. 6E). These findings demonstrated that CLP-19 might produce an immunomodulatory effect by influencing expression level of TLR4 specifically on the cell surface when challenged with LPS. To investigate the relationship between prophylactic time and anti-LPS activity of CLP-19, the surface TLR4 and TNF-α of RAW 264.7 cells pretreated with peptide at various times prior to LPS challenge were detected. The results showed that CLP-19 had a time-dependent inhibitory effect on the expression of surface TLR4 and TNF-α in 15 h. However, by further prolonging the prophylactic time of CLP-19 up to 25 h, the amounts of surface TLR4 and TNF-α gradually increased (Fig. 6F). This indicated that the optimal prophylactic time of CLP-19 was 15 h in vitro. LPS is a major component of the membranes of Gram-negative bacteria and is released into the extracellular space during proliferation and cell death. Free LPS is recognized by LPS binding protein (LBP) on host cells (27, 28). The combined LPS/LBP interacts with CD4 and TLR4/MD-2 at the cell membrane surface, which leads to activation of the MyD88-dependent and -independent signaling pathways (29, 30). Therefore, abundant exposure to LPS may induce an exaggerated stimulation of these immune-related signaling pathways and upregulate expression and release of inflammatory cytokines; such an unmitigated inflammation process is the hallmark of severe sepsis and underlies sepsis-related death (31, 32). Recent therapeutic approaches for treating sepsis have included targeted inhibition of TNF-α and other inflammatory mediators (33); however, these approaches have not yet produced a significant increase in the survival rate of sepsis patients (34). It is thought that the proinflammatory process should be targeted for inhibition much earlier, prior to stimulation of the intracellular signaling pathways. A therapeutic agent that can directly bind to and neutralize LPS prior to its interaction with the host cells has been proposed as a potentially effective LPS-neutralizing drug. Toward this end, we designed and synthesized a cyclic peptide, CLP-19, based on the structural features of LALF. Our initial studies of this peptide suggested that it could competitively interrupt the formation of the LPS/LBP complex, inhibiting the activation of TLR4 and the subsequent inducement of the proinflammatory cytokine cascade (22, 23). Moreover, prophylactic injection of CLP-19 into the LPS-induced sepsis mouse model was found to prolong life span and decrease the overall mortality rate. Importantly, the half-life of CLP-19 is almost 30 min in the bloodstream, but the maximum protective effect of the prophylactic injection occurred when given 20 h prior to the LPS attack (data not shown). In other words, through almost 60 half-lives, the residual amount of CLP-19 in vivo is ineffective for preventing lethal LPS attack via a direct neutralization manner. These apparently conflicting results suggested that the mechanisms underlying the anti-LPS effect of CLP-19 involve more than direct neutralization. Other groups have reported that LALF has immunoregulatory functions, such as causing downregulation of the inflammatory protein HMGB1 in a sepsis model (35). Considering these finding collectively, we hypothesize that CLP-19, derived from LALF, may exert a protective immunoregulatory effect in LPS-induced sepsis conditions and that in vivo delivery of CLP-19 may have therapeutic benefit. To verify this hypothesis, biocytin- and FITC-linked CLP-19 were used to search for and visualize the binding partners of CLP-19. We first confirmed the similar structural and biological properties of CLP-19, CLP-19B, and CLP-19F by a series of chemical and biochemical methods. With the help of CLP-19 counterparts, binding partners of CLP-19 were identified by screening the mouse RAW 264.7 cell line. α- and β-tubulin were the predominant interacting partners of CLP-19 and specifically bound to CLP-19 in a direct manner. Computer-simulated docking analysis predicted that CLP-19 mainly bound within the groove of the α- and β-tubulin heterodimers via several residues in both subunits. Additionally, a possible explanation for CLP-19–related immunoregulatory function was found wherein CLP-19 may disrupt the kinetic process of microtubules via inducing polymerization of α- and β-tubulin and preventing depolymerization of formed microtubules. The microtubules are an integral and highly dynamic component of the cytoskeletal network that modulates many intracellular trafficking processes, including endoplasmic reticulum (ER) export, ER-to-Golgi transport of newly synthesized proteins, endocytosis of cell membrane–associated factors, and uptake process of peptides (24, 26, 36). Microtubule function is closely related to the dynamic flux of polymerization and depolymerization. The CLP-19 may enter into cells via energy-independent direct translocation or/and energy-dependent endocytosis (data not shown) and then bind with microtubules, which obstructs the dynamic flux of microtubules and thereby influences the microtubule-dependent intracellular trafficking processes. TLR4, the principal signaling receptor for LPS, is synthesized, stored, and modified in the ER and Golgi apparatus system (37). The precise downstream effects and duration of activated TLR4 signaling relies on the highly regulated intracellular trafficking processes, including ER-to-Golgi-to-cell surface transport of the nascent receptors, agonist-induced cell surface-to-endosome internalization of the receptors, endosome-to-cell surface recycling of the internalized receptors, and intracellular targeting of the receptor to the lysosome for degradation (38). In each of these processes, microtubule-dependent vesicular transport plays an essential role, allowing rapid shuttling of cargo carriers to their correct destination (37, 39, 40). 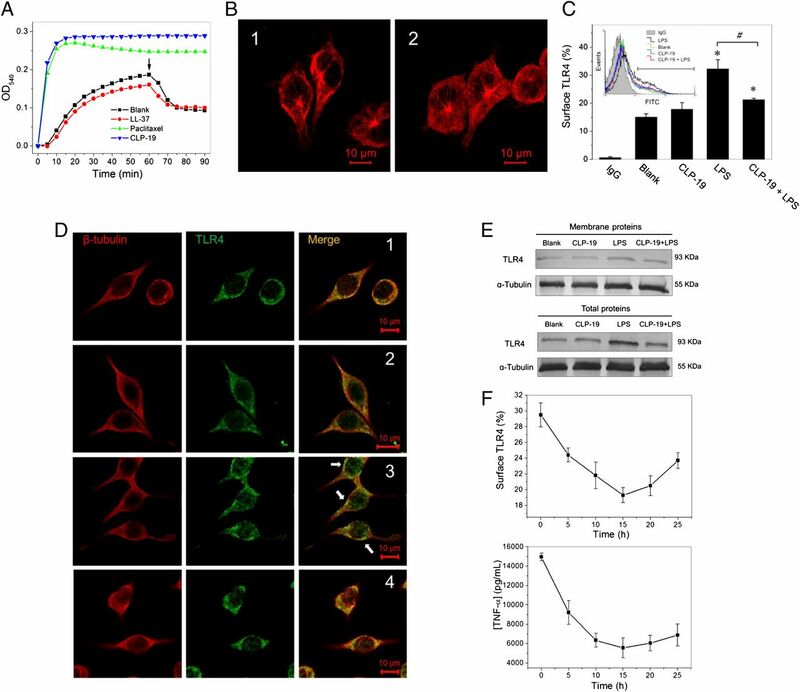 In this study, we also investigated whether the CLP-19 and microtubules interaction affected the ER-to-cell surface trafficking processes of TLR4. When RAW 264.7 cells were stimulated by LPS, TLR4 expression on the cell surface became remarkably enhanced, possibly reflecting the activation of a TLR4 signaling cascade to increase TLR4 gene expression, protein synthesis, or transport of intracellular stores to the cell surface (41, 42). Prophylactic administration of CLP-19 prior to LPS challenge, however, led to a significant decrease in TLR4 expression on the cell surface. Taken together with the finding that CLP-19 alone had no influence on the expression of total TLR4, we speculate that the attenuation of cell surface TLR4 is possibly mediated by the CLP-19 binding to microtubules, which disrupts the kinetic process of microtubules and thereby makes the microtubule-dependent vesicular export of TLR4 less effective. Endocytic trafficking of cell membrane receptors may also influence the amount of surface TLR4 and terminate the LPS-induced TLR4 signal by delivering the activated receptors to the lysosomes for degradation (43). It is possible that the internalization ratio is attenuated by the interaction of CLP-19 and microtubules, indirectly leading to an accumulation of TLR4 on the cell surface. However, we speculate that the efficacy of accumulation of TLR4 mediated by a decreased internalization ratio is far lower than the attenuation of TLR4 mediated by a decrease in export vesicular transport, especially upon challenge with LPS. Therefore, the overall performance of prophylactic treatment with CLP-19 is expected to remarkably decrease the amount of surface TLR4. It is reported that LPS-triggering signaling pathways are initiated by the TLR4 on the cell surface rather than in the internal pool, and thus TLR4 surface expression influences the activities of immunocytes (41, 44). CLP-19 downregulates the expression of surface TLR4, thereby alleviating the responses of macrophages associated with LPS as measured by downstream proteins such as TNF-α and p-IκB-α. The relationship between anti-inflammatory activity and prophylactic time of CLP-19 was also investigated in vitro. The optimal protective effect of the prophylactic administration occurred when given 15 h prior to the LPS attack. This did not completely conform to our in vivo data (20 h). We presume that this can be due to the more complicated environment in vivo. Besides macrophages, other kinds of immunocytes, such as monocytes, endothelial cells, dendritic cells, and B/T cells, may have different responses to CLP-19 peptide. Hence, the optimal prophylactic time was delayed in vivo (20 h) versus in vitro (15 h). Note that whereas CLP-19 has no effect on TLR4 and TNF-α, it can induce activation of NF-κB to a small extent (compared with LPS). Despite that the specific mechanisms remain elusive, the involvement of microtubules in regulating the NF-κB signaling pathway has wide acceptance (45, 46). We speculate that CLP-19 may mediate this effect (activation of NF-κB) by stabilizing microtubules. However, prophylactic administration of CLP-19 significantly alleviated the activation of NF-κB associated with LPS. It is possible that when challenged with LPS, the CLP-19–induced inhibition of the NF-κB signaling pathway that is mediated by decreasing the availability of TLR4 on the cell surface overcomes the CLP-19–induced activation of the NF-κB signaling pathway mediated by stabilizing microtubules. Additionally, it was reported that microtubule-dependent endocytosis was required for the uptake process and immunomodulatory activities of LL-37 in A549 epithelial cells (24). However, in the present study, LL-37, which served as a control peptide, was not found to interact with microtubules. We think that such an endocytic process of LL-37 possibly relied on microtubule-associated motor proteins, such as kinesin and dynein, rather than on direct binding to microtubules (47). By using the collective findings from previous studies and those in this study, we have attempted to construct the anti-LPS mechanisms of CLP-19 that occurs in mouse RAW 264.7 cells. First, CLP-19 in the extracellular space can bind directly to LPS and competitively inhibit formation of the LPS/LBP complex, thereby preventing the subsequent TLR4 activation and successive induction of cytokines. Next, CLP-19 in the intracellular space can interact with microtubules and perturb the dynamic equilibrium of microtubules, thereby making the microtubule-dependent vesicular transport less effective and decreasing the availability of TLR4 for transport from the ER to the cell surface (Fig. 7). Proposed model of the mechanism of CLP-19 anti-LPS activity. (1) In the extracellular environment, CLP-19 directly binds to LPS and competitively blocks formation of the LPS/LBP complex, thereby preventing TLR4 activation and the successive induction of cytokines. (2) In the intracellular environment, CLP-19 binding to microtubules perturbs the dynamic equilibrium of microtubules, thereby making the microtubule-dependent vesicular transport less effective and decreasing the availability of TLR4 for transport from the ER to the cell surface. 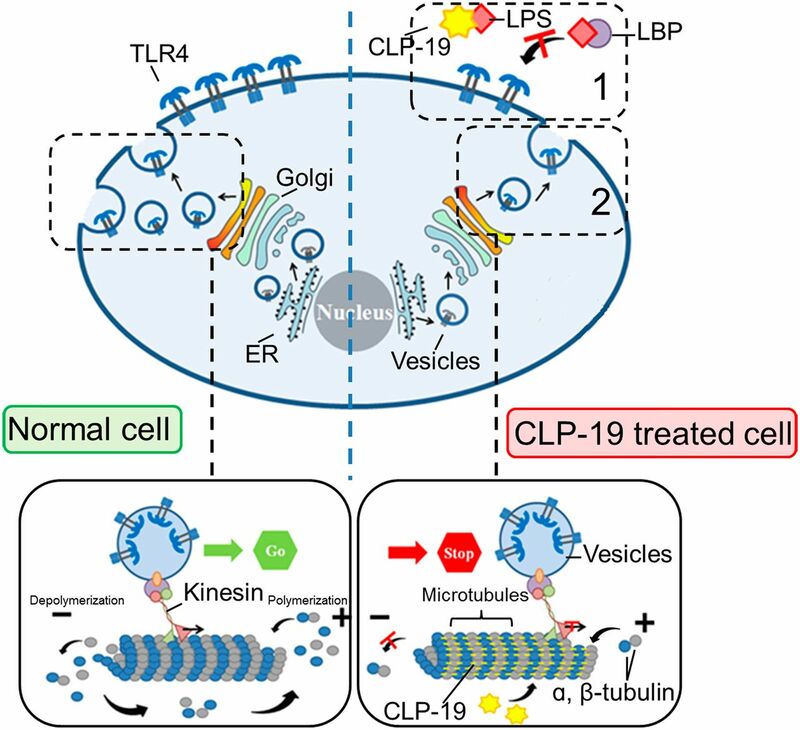 In conclusion, the extension of our study of the CLP-19 peptide revealed that in addition to its direct LPS-neutralizing activity in the extracellular space, CLP-19 exerts an immunomodulatory effect in the intracellular space via binding to microtubules and influencing the microtubule-dependent vesicular transport of an immune-related signaling factor. Thus, we have revealed a novel function of CLP-19 that may represent a new line of investigation to better understand the immune mechanisms of other HDPs and their potential benefit as targets of molecular therapies. We are grateful to Dr. Jennifer Gardy for expert advice in writing this manuscript. This work was supported by National Natural Science Foundation of China Grants 81001441 and 81173102, the Science and Technology Research Projects of the Chongqing Science and Technology Committee of China (Grant 2010BB5197), and National Key Science-Technology Special Project of China Grant 2012ZX09102101-012. 2002. The immunopathogenesis of sepsis. Nature 420: 885–891.
. 2007. Two modes of ligand recognition by TLRs. Cell 130: 979–981. 2010. Recycling endosomes and TLR signaling: the Rab11 GTPase leads the way. Immunity 33: 578–580.
. 1989. The complex pattern of cytokines in serum from patients with meningococcal septic shock: association between interleukin 6, interleukin 1, and fatal outcome. J. Exp. Med. 169: 333–338.
. 2010. Novel insights for systemic inflammation in sepsis and hemorrhage. Mediators Inflamm. 2010: 642462.
. 1998. Molecular basis of host-pathogen interaction in septic shock. Curr. Opin. Microbiol. 1: 49–55.
. 2006. Severe sepsis and septic shock: review of the literature and emergency department management guidelines. Ann. Emerg. Med. 48: 28–54.
. 2012. Time to initiation of treatment with polymyxin B cartridge hemoperfusion in septic shock patients. Blood Purif. 33: 252–256.
. 2011. Effect of hemoperfusion using polymyxin B-immobilized fibers on non-shock rat sepsis model. J. Surg. Res. 171: 755–761.
. 2007. The bactericidal/permeability-increasing protein (BPI) in infection and inflammatory disease. Clin. Chim. Acta 384: 12–23.
. 2005. A murine antibacterial ortholog to human bactericidal/permeability-increasing protein (BPI) is expressed in testis, epididymis, and bone marrow. J. Leukoc. Biol. 77: 369–377. 2003. Bactericidal/permeability-increasing protein (BPI) and lipopolysaccharide-binding protein (LBP): structure, function and regulation in host defence against Gram-negative bacteria. Biochem. Soc. Trans. 31: 785–790.
. 2011. Human anti-microbial cathelicidin peptide LL-37 suppresses the LPS-induced apoptosis of endothelial cells. Int. Immunol. 23: 185–193.
. 2010. Effect of the antimicrobial peptide LL-37 on Toll-like receptors 2-, 3- and 4-triggered expression of IL-6, IL-8 and CXCL10 in human gingival fibroblasts. Cell. Immunol. 264: 104–109.
. 2009. Human cathelicidin peptide LL-37 modulates the effects of IFN-γ on APCs. J. Immunol. 183: 5788–5798.
. 2009. Low concentrations of LL-37 alter IL-8 production by keratinocytes and bronchial epithelial cells in response to proin£ammatory stimuli. FEMS Immunol. Med. Microbiol. 56: 233–240.
. 2005. Mastoparan, a G protein agonist peptide, differentially modulates TLR4- and TLR2-mediated signaling in human endothelial cells and murine macrophages. J. Immunol. 174: 4252–4261.
. 2005. Structure of a synthetic fragment of the LALF protein when bound to lipopolysaccharide. J. Med. Chem. 48: 1666–1670.
. 2004. Differential regulation of Th1/Th2 in relevant tissues for sepsis pathogenesis with a Limulus anti-LPS factor-derived peptide increases survival in Gram-positive sepsis. Int. Immunopharmacol. 4: 1343–1351.
. 2003. A Limulus anti-LPS factor-derived peptide modulates cytokine gene expression and promotes resolution of bacterial acute infection in mice. Int. Immunopharmacol. 3: 247–256.
. 2008. A synthetic cyclic peptide derived from Limulus anti-lipopolysaccharide factor neutralizes endotoxin in vitro and in vivo. Int. Immunopharmacol. 8: 775–781.
. 2011. 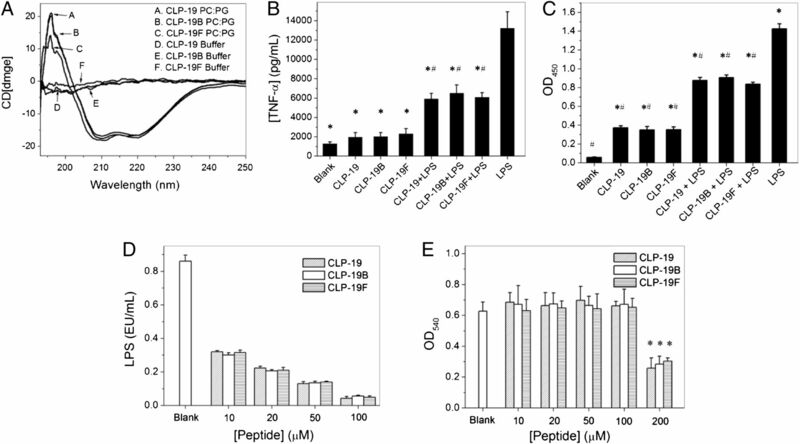 Cyclic Limulus anti-lipopolysaccharide (LPS) factor-derived peptide CLP-19 antagonizes LPS function by blocking binding to LPS binding protein. Biol. Pharm. Bull. 34: 1678–1683.
. 2005. Interaction and cellular localization of the human host defense peptide LL-37 with lung epithelial cells. Infect. Immun. 73: 583–591.
. 1998. Tubulin structure: insights into microtubule properties and functions. Curr. Opin. Struct. Biol. 8: 785–791.
. 1998. New insights into microtubule structure and function from the atomic model of tubulin. Eur. Biophys. J. 27: 431–436.
. 2000. Lipopolysaccharide induces physical proximity between CD14 and Toll-like receptor 4 (TLR4) prior to nuclear translocation of NF-κB. J. Immunol. 165: 3541–3544.
. 2007. Mechanism of interaction of optimized Limulus-derived cyclic peptides with endotoxins: thermodynamic, biophysical and microbiological analysis. Biochem. J. 406: 297–307.
. 2005. Modulatory effects of sCD14 and LBP on LPS-host cell interactions. J. Endotoxin Res. 11: 225–229.
. 2004. Toll-like receptor 4 functions intracellularly in human coronary artery endothelial cells: roles of LBP and sCD14 in mediating LPS responses. FASEB J. 18: 1117–1119.
. 2012. Novel therapeutic targets for sepsis: regulation of exaggerated inflammatory responses. J. Nippon Med. Sch. 79: 4–18.
. 2012. The immunopathology of sepsis: pathogen recognition, systemic inflammation, the compensatory anti-inflammatory response, and regulatory T cells. J. Vet. Intern. Med. 26: 457–482.
. 1998. Nuclear factor κB: a pivotal role in the systemic inflammatory response syndrome and new target for therapy. Intensive Care Med. 24: 1131–1138.
. 2001. Assessment of the safety of recombinant tissue factor pathway inhibitor in patients with severe sepsis: a multicenter, randomized, placebo-controlled, single-blind, dose escalation study. Crit. Care Med. 29: 2081–2089.
. 2008. Antagonistic effects of Limulus anti-lipopolysaccharide factor on high mobility group box-1 in vitro. J. Fujian Med. Univ. 42: 212–215.
. 1998. Tubulin and microtubule structure. Curr. Opin. Cell Biol. 10: 16–22.
. 2002. Toll-like receptor 4 resides in the Golgi apparatus and colocalizes with internalized lipopolysaccharide in intestinal epithelial cells. J. Exp. Med. 195: 559–570.
. 2011. α2B-adrenergic receptor interaction with tubulin controls its transport from the endoplasmic reticulum to the cell surface. J. Biol. Chem. 286: 14080–14089.
. 2003. Role of microtubules in fusion of post-Golgi vesicles to the plasma membrane. Mol. Biol. Cell 14: 1558–1569.
. 1997. Microtubule-dependent transport of secretory vesicles visualized in real time with a GFP-tagged secretory protein. J. Cell Sci. 110: 1453–1463.
. 2006. Simvastatin suppresses endotoxin-induced upregulation of Toll-like receptors 4 and 2 in vivo. Atherosclerosis 189: 408–413.
. 2011. Atorvastatin suppresses LPS-induced rapid upregulation of Toll-like receptor 4 and its signaling pathway in endothelial cells. Am. J. Physiol. Heart Circ. Physiol. 300: H1743–H1752.
. 1990. Microtubule- and motor-dependent fusion in vitro between apical and basolateral endocytic vesicles from MDCK cells. Cell 62: 719–731.
. 2002. Lipopolysaccharide rapidly traffics to and from the Golgi apparatus with the Toll-like receptor 4-MD-2-CD14 complex in a process that is distinct from the initiation of signal transduction. J. Biol. Chem. 277: 47834–47843.
. 2009. Microtubule-mediated NF-κB activation in the TNF-α signaling pathway. Exp. Cell Res. 315: 3242–3249.
. 2003. Microtubule disruption utilizes an NFκB-dependent pathway to stabilize HIF-1α protein. J. Biol. Chem. 278: 7445–7452. 1998. Kinesin and dynein superfamily proteins and the mechanism of organelle transport. Science 279: 519–526.